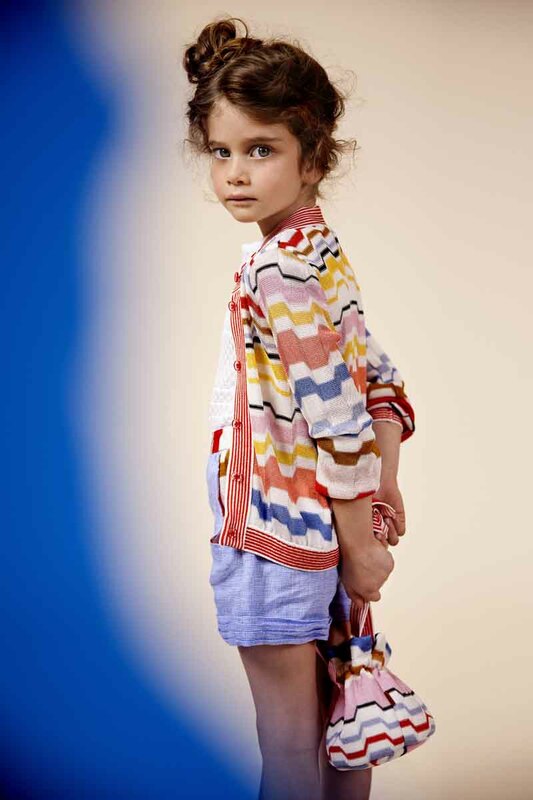 MILAN, Jun 26, 2014/ — Iconic Missoni colour and pattern are re-interpreted for the Girls Summer 2015 collection. A natural, cheerful sense of imagination emerges in sunny solids and degrade multi colour tones. Varied textures, patterns, stripes, zigzags, puff stitches, polka dots and fret patterns are combined, juxtaposed and overlapped to create various optical effects: sensations of movement. Colourful knitwear is marked by fret motifs, the iconic Missoni pattern for 2015. Intarsias, each created with differing techniques, work with hounds-tooth linen, zigzag print jersey, lace in solid colours, golden Lurex and multicolour Swarovski crystals. The collection includes comfortable shorts and baggy pants, leggings and little flared skirts, T-shirts and crew neck cardigans cut into little bolero jackets. Elegant flared dresses with a wide front edge or smocked waists, puffy sleeves, and charming skirts with scalloped flounces are perfect for budding fashionistas. Sophisticated reversible trench coats, made of knitwear with a water-repellent finish, and are edged in knit ribbons in solid colours compliment the look. The Girls’ Beachwear capsule collection includes one and two piece swimsuits trimmed with ruffles with matching kaftans. These charming and versatile go-anywhere outfits combine white with bright shades of red, orange and yellow, and green, light blue, blue and rust each to be worn in her own way. Accessories include the spectacular effect of colourful straw hats and turbans in two-tone knit grosgrain and little pouch bags to sling over their shoulders to go with the outfit. The capsule collection for baby girls and boys comes in two versions. First the iconic zigzag print on jersey includes a sleep sack, blanket, overalls, rompers with high-cut legs, a little hat and bib. This season, they are reworked in white offset by bright red, orange and yellow or navy blue, turquoise and light blue. Made in a two-tone knit with a fret pattern, the second alternates white and navy blue, white and red, white and light blue, and white and pink. This capsule includes a blanket, little dress, short-sleeved bubble rompers, overalls and rompers with high-cut legs.